Teachers...Join Us in Creating the Renaissance Thinkers of Tomorrow! We are offering employment opportunities for experienced teachers who are deeply committed to assuring that all students achieve high levels of academic and personal success, and to their own development as professional educators. A career at OAHS is exciting, as it offers teachers creative autonomy in the development of quality lessons, while providing the strong support of staff collaboration in ensuring students are learning in every class, every day. The day-to-day student experience at OAHS is quite different from what one might encounter at other high schools. Advisory teams will work together with the Western Aerospace Museum to maintain and develop actual museum exhibits. 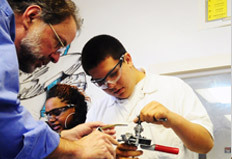 Students will take courses in aviation maintenance, and business at the College of Alameda. School culture is centered on academic rigor, compassionate support for individual growth, and professional conduct. Teachers will be encouraged to experiment, take risks and fully utilize the resources provided by our community partners. The instructional program is based on integrating brain-research and best practices in the development of intentional learning environments and critical thinking. No aviation experience is required. OAHS is a comprehensive high school. The aviation components of our program are taught at the award winning College of Alameda Aviation Maintenance Technology Program. We are an equal opportunity employer. Phase 2 - Application Packet: The application packet requires you to write a one-page description of your educational philosophy and complete the Employment Questionnaire. Don’t forget to put your name at the top of each document. Please limit your response to each prompt to 250 words. When emailing your application type "your last name--application07" on the subject line and be sure to attach both documents. When we receive your completed application, we will send you immediate confirmation that we have received your packet. After reviewing your application we will invite you to interview, or thank you for your interest. Phase 3 - Interview: If your application is selected we will schedule an interview with you. Based on our mutual schedules and locations you may be interviewed in person or by phone. We may ask you to bring examples of student work and lesson plans to the interview. If you are interviewed by phone we will request that you email or fax us your work samples. If your interview is successful we will schedule an opportunity to see you teach. Phase 4 - Teaching Demo: We may ask you to send us a video of your teaching, or set to up an appointment for us to see you teach in person. Phase 5 - Family and Community Interview: In the final round you will interview with parents, students and board members. If we offer you a position, you will need to provide all of the following before reporting to work. Please prepare these items in advance.